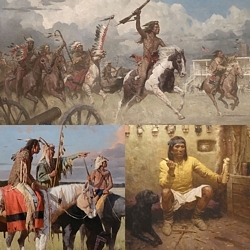 Image Size: 25 1/2"w x 18"h.
These Piegan Blackfeet Warriors are returning to their encampment. As they approach Red Rock Falls they stop to share a story of the Red Rock Crossing passed down from a revered tribal elder. This spectacular vista was protected from development by President Taft in 1910 and is now a jewel of Glacier National Park. The Blackfeet Reservation adjoins the Park and is home to over 8,000 Blackfeet Native Americans. The majestic 54" x 38" original painting by Z.S. Liang sold at the 2009 Jackson Art Auction at a record price. Only a handful of collectors will hang this historic fine art edition in their home for a fraction of that price.